A simple one-bowl batter is the base of this beautiful almond wedding cake, decorated with almond buttercream icing and pearl and flower flourishes. 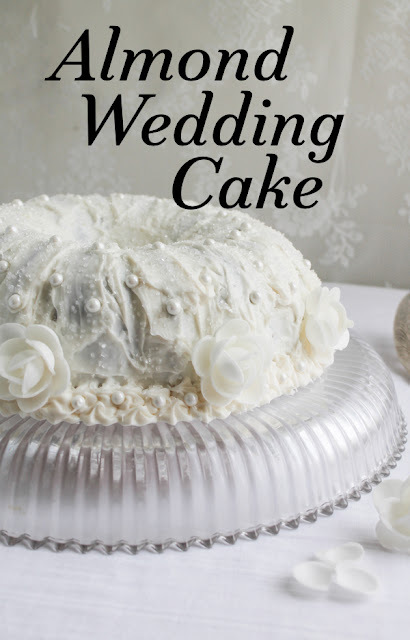 My mother’s very favorite cake is wedding cake. She is seriously disappointed if she has to leave a reception before the cake is cut. 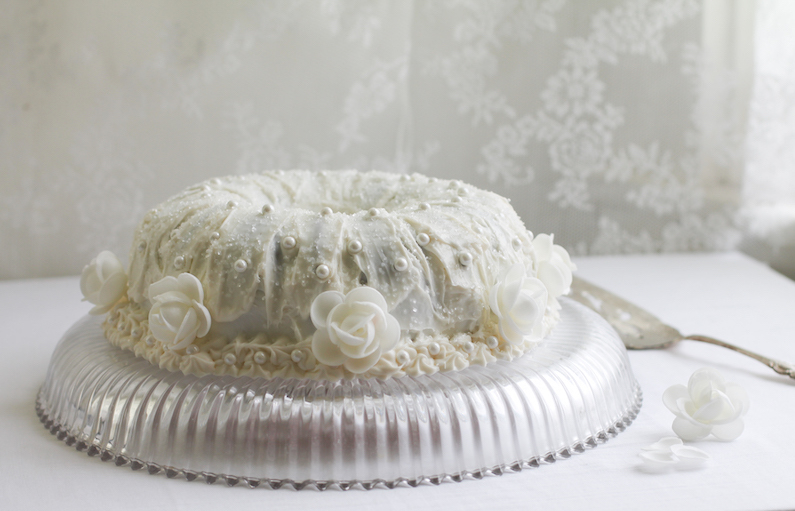 And if it’s almond wedding cake, oh my! No way she's leaving without a piece! 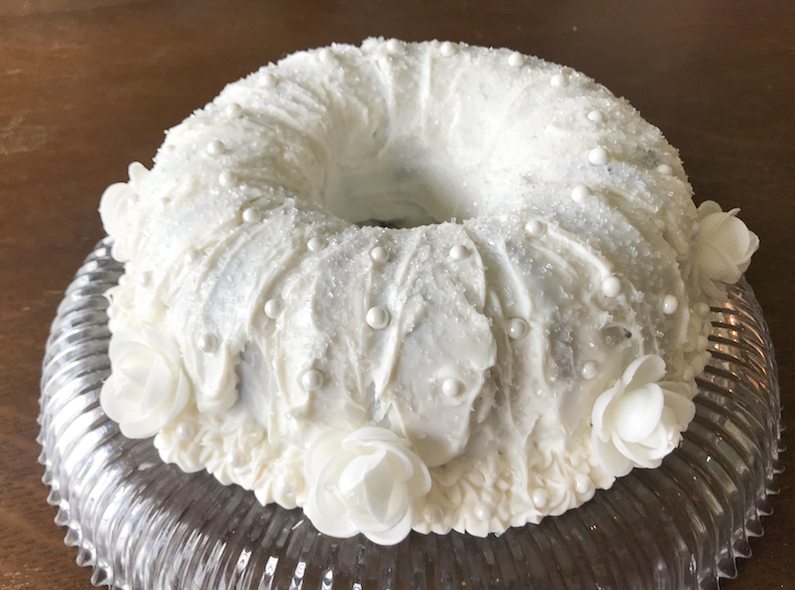 When the theme "white cake" was chosen a few months back for this month’s Bundt Bakers, I planned right away to bake this cake when I was in Houston visiting my mother. She is an avid follower of my blog and often sends me notes to say how hungry she gets from looking at my photos. It would have been too cruel to bake her favorite cake and not give her some. 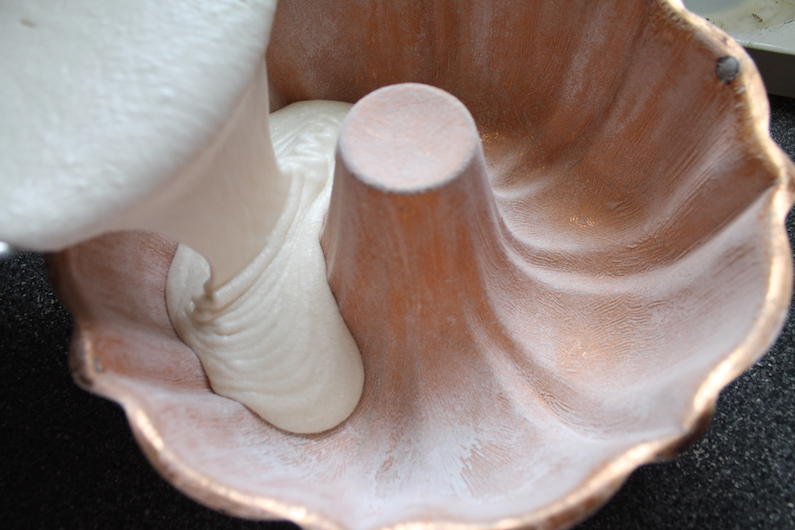 Credit for this batter recipe is goes to Wedding Cakes for You. The ingredients list is all theirs, except for the metric conversions. 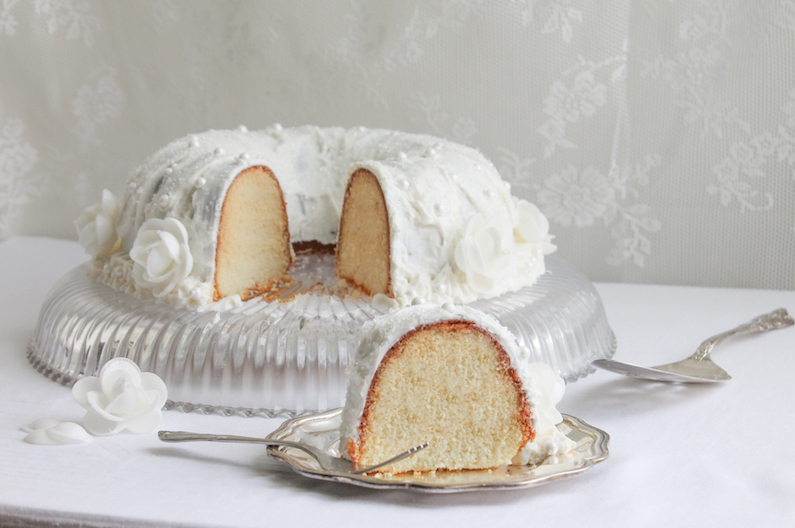 A two-layer cake bakes up perfectly in a 12-cup Bundt pan. I think we can all agree that despite this not being a traditional shape for wedding cake, it works beautifully. Who doesn't love a Bundt? 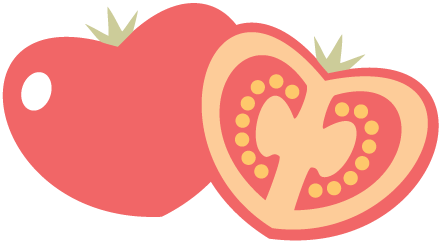 Preheat the oven to 350°F or 180°C. Grease a 12-cup Bundt pan with shortening and then coat it with flour. 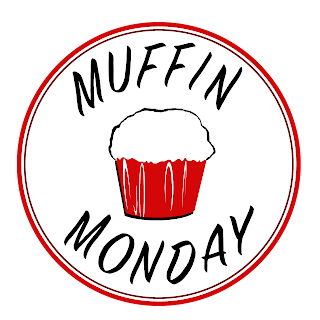 Add the flour, sugar, baking powder, baking soda and salt to your mixing bowl. Give it a mix. 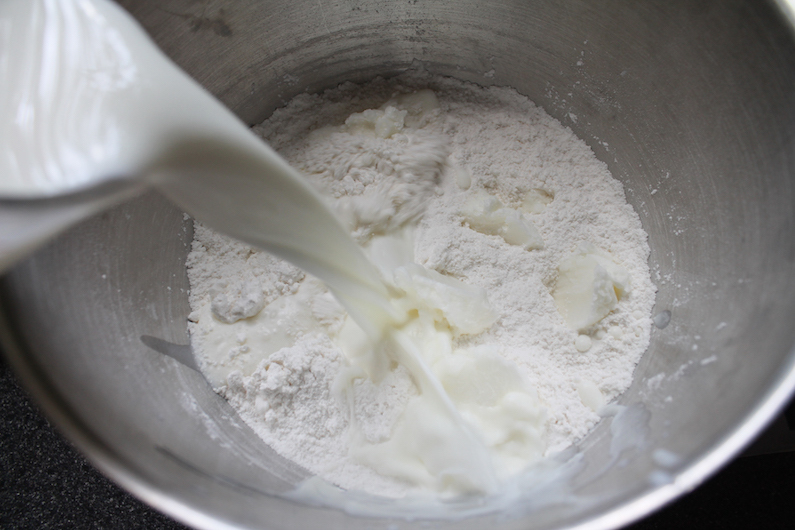 Add the shortening to the flour mix along with the milk and almond extract. As soon as it’s all mixed, turn the mixer up to medium high. Beat for a couple of minutes. 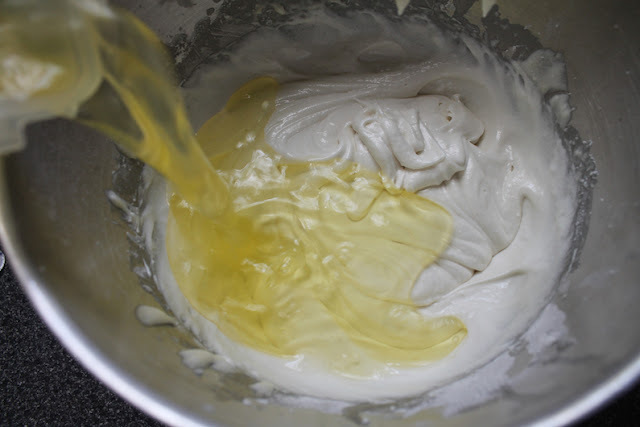 Add in the egg whites and beat slowly till they are mixed in. Now beat on medium high for 2 minutes. Meanwhile, make the frosting by beating together the butter, sugar, milk, vanilla, and salt until light and fluffy. 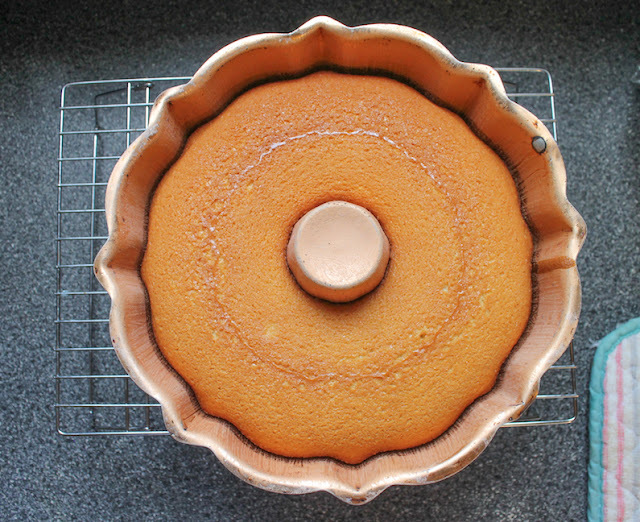 Remove the cake from the oven and leave to cool for about 10 minutes in the Bundt pan. Turn the Bundt out of the pan onto a wire rack and cool completely before frosting and decorating. 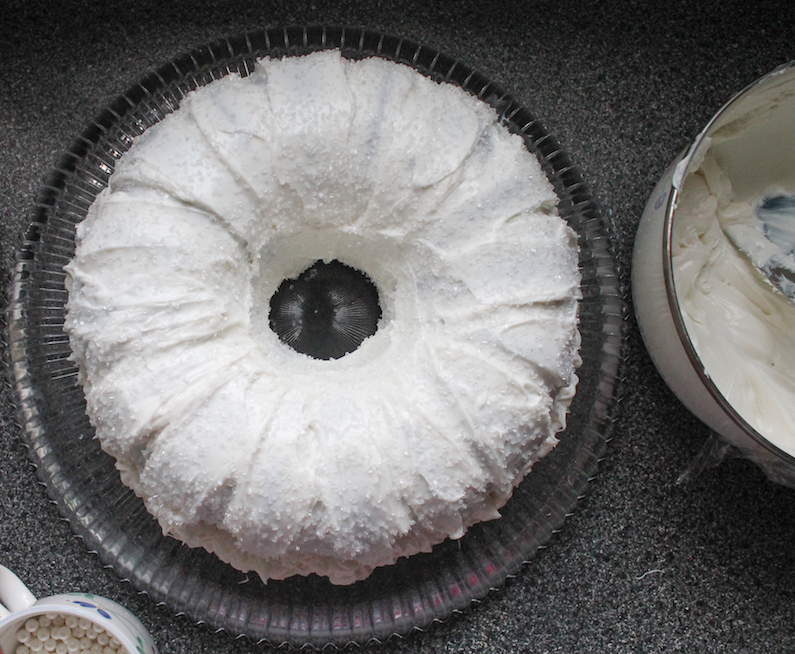 Once cool, I spread the frosting on so that the contours of the Bundt pan still showed through, then covered it immediately with sparkling white sugar sprinkles so that they would stick. These are the flowers, sprinkles and pearls I used for decoration. What's your favorite white cake? 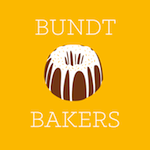 Check out the list below for the wonderful cakes my Bundt Bakers are sharing today. 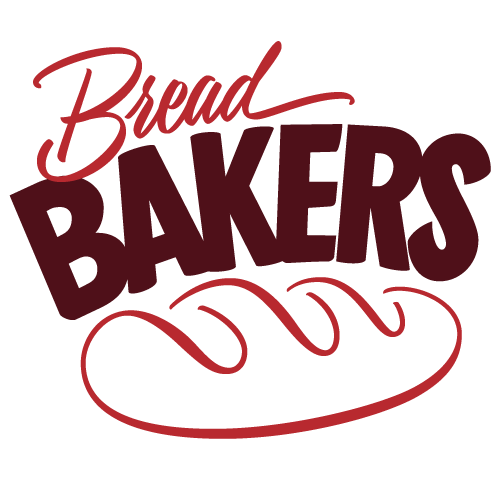 Many thanks to our host Nichole from Cookaholic Wife!